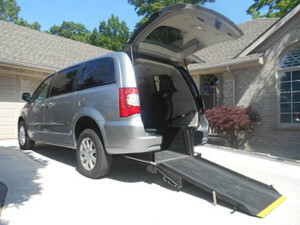 Rear Entry wheelchair vans feature a lowered floor conversion that allow the wheelchair occupant to enter the vehicle from the back. Rear Entry wheelchair accessible vans are the ideal type of mobility van for people who are looking for an economically-friendly conversion that also allows them convenience in their daily lives. Rear entry vans make it easy to park and load your van from parking lots, garages and narrow spaces in the way that side entry vans cannot. Our rear entry vans are converted and outfitted with a low effort, bi-fold ramp that is manually operated without hydraulics or electronics and requires zero maintenance. The ramp is also powder coated in black texture to ensure durable, non-skid performance, even when the surface is wet. *Vehicle must come equipped with Stow n’ Go mid-row seating or additional cost will be incurred. Contact Goldline Mobility today for further details or to arrange for a demonstration at your location. Click here to view and print the Rear Entry Conversion Brochure.